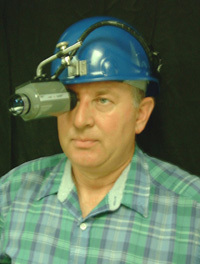 The FIND-R-SCOPE 85050 is a self-contained, hands-free, Helmet-Mounted Infrared Viewer with a spectral sensitivity of 350-1350 nm. Note: The 85050 replaces the discontinued model 85050A. The FIND-R-SCOPE 85050A has been DISCONTINUED. To see its functionally equivalent replacement, please look for model 85050 in the left hand column of this page or, please type 85050 in the "Search" box on the top left of this page, press "GO", then select 85050 from the list. 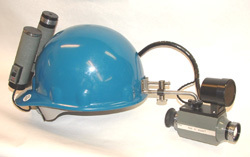 The FIND-R-SCOPE 85051 is a self-contained, hands-free, Helmet-Mounted Infrared Viewer with a spectral sensitivity of 350-1350 nm. This model includes an Infrared Light Source. Note: The 85051 replaces the discontinued model 85051A. The FIND-R-SCOPE 85051A has been DISCONTINUED. To see its functionally equivalent replacement, please look for model 85051 in the left hand column of this page or, please type 85051 in the "Search" box on the top left of this page, press "GO", then select 85051 from the list.